Can you believe it's taken me this long to get around to this one? To be perfectly honest, I had little interest in it based solely on the title and the vast amount of love it got from, well, everyone. I can be truculent that way. But a sufficient amount of time has passed since the hubbub, that I was quite happy to see a copy show up among my Christmas presents and I opened it up with alacrity over the break. What a perfectly lovely book and how right everyone was talking it up here, there, and everywhere. I was intrigued to find out it was written by two women--relatives, no less. My understanding is that Mary Ann Shaffer asked her niece (and fellow writer) Annie Barrows to help her finish the book once Ms. Shaffer's failing health began to seriously impede its progress toward publication. I'm so glad the book was finished and published and not lost in the shuffle. I wonder, sometimes, how many gems are. The year is 1946 and Juliet Ashton is a columnist turned author struggling to write her second book, following her wildly successful compilation of wartime essays. Having just completed a rather grueling tour promoting the book, she is back in London and staring at the empty pages on her desk just waiting to be filled. Then she receives a letter from a man by the unlikely name of Dawsey Adams, wondering whether or not she might direct him to some further work by his beloved author Charles Lamb. You see, he purchased one of his own volumes of Lamb secondhand and it had Juliet's name inscribed inside. Juliet is charmed to find another Lamb admirer and immediately writes back to Mr. Adams. And thus begins an extensive and fruitful correspondence the likes of which neither of them have ever known. 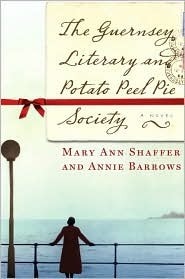 Dawsey belongs to an extremely unique literary society known as the Guernsey Literary and Potato Peel Pie Society. The name alone whets Juliet's appetite for more. And it turns out there is so much more to this little Channel Island society than meets the eye. Inaugurated during the German occupation of Guernsey, this small group of ragtag members meets faithfully to discuss books and huddle together against the encroaching horrors of war. Through their experiences, Juliet's imagination is fired up and the novel she keeps trying and failing to write suddenly takes off. Best to say we weren't a true literary society at first. Aside from Elizabeth, Mrs. Maugery, and perhaps Booker, most of us hadn't had much to do with books since our school years. We took them from Mrs. Maugery's shelves fearful we'd spoil the fine papers. I had no zest for such matters in those days. It was only by fixing my mind on the Commandant and jail that I could make myself to lift up the cover of the book and begin. It was called Selections from Shakespeare. Later, I came to see that Mr. Dickens and Mr. Wordsworth were thinking of men like me when they wrote their words. But most of all, I believe that William Shakespeare was. Mind you, I cannot always make sense of what he says, but it will come. It seems to me the less he said, the more beauty he made. Do you know what sentence of his I admire the most? It is, "The bright day is done, and we are for the dark." I wish I'd known those words on the day I watched those German troops land, plane-load after plane-load of them--and come off ships down in the harbor! All I could think of was damn them, damn them, over and over. If I could have thought the words "the bright day is done and we are for the dark," I'd have been consoled somehow and ready to go out and contend with circumstance--instead of my heart sinking to my shoes. It was just one of those moments in which the words--the whole sentiment--was just so right that, despite the fact that I'm not fictional, not a man, did not live during or anywhere near just after World War II, and have not had to watch my home invaded, I knew. The words of William Shakespeare connected us and I knew. Such moments are rare and beautiful in the fictional works I read and I treasure them up. As I said, I laughed innumerable times while reading The Guernsey Literary and Potato Peel Pie Society and I saw the events of the time period and place in an entirely new way. The book was so far from the precious and fluffy volume I was expecting that I wasn't completely prepared for how delightful and moving it would be. The history, the love story, the band of friends . . . it was magic. I am, and always have been, a fan of epistolary novels and it was a treat to sit back and let Juliet and Dawsey, Sidney and Isola recount the events and moments of their lives for me through the series of letters and journal entries that make up this remarkable story. I know the format bothers some readers, but for me the slight removal only serves to heighten my awareness of the characters and to underline the subtlety inherent in their private lives. I was won over by each one of them and suffice it to say that a particular scene at the end where a certain someone is on a ladder and another someone is spying through the window still brings a smile to my face and laughter to my lips. I adored this book and think it would be just wonderful read aloud between family, friends, or any group of like minded individuals who share the kind of love for the written word that forms the beautiful core of The Guernsey Literary and Potato Peel Pie Society . A keeper. I felt the same way, mostly because my mother recommended it and we don't have the same tastes. It took me a while to get into it but I was definitely emotional by the end. I think I enjoy it more the more I think about it and almost want to read it again without the attitude I had when I started. It definitely was a beautifully written story. So glad you liked it! This and The Book Thief remain two of my all time favorite historical fiction works. I love that there are passages that brought me to tears (like the one you mentioned) juxtaposed with ones that made me laugh or even want to stand up and applaud. Wonderful review, as always. Love the blog, Angie! It's so great! I share it with everyone I know that's into YA, or books in general. Hope you're feeling good! Congrats again! I'm always turned off by the popularity and hype of books like this. Looks like I should give it a fair chance. I felt the same way - wary of picking it up because of all the love everyone was giving it. I'm usually turned off by stuff that everyone else finds so moving (I tend to find it emotionally manipulative). But I tried this one on a whim and just LOVED it. I think the only proper descriptor that comes to mind is heartwarming. It's just so lovely - and it reminded me a lot of another recent favorite - Jamie Ford's Hotel on the Corner of Bitter and Sweet. And my favorite epistolary novel is A Woman of Independent Means. Have you read it? I remember going through a very big pen-to-paper letter writing phase after that one. Great review. Have you read 84 Charing Cross Road? I think you’d like it very much as well. Yay! I'm glad you finally read this one. My copy is literally covered with underlines and folded corners because there was just so much to love about the story. So glad you liked it too! Okay, you've convinced me. I was worried that everyone recommended this one to me, but laughing and crying? I'm sold! I loved this book so much more than I expected to. I thought it was going to be a fun, light read, but I tear up every time I read it. That passage is one place where I get teary, and when they talk about Elizabeth and all the brave things she did -- it's such a good book. Stopping by very late to say Yay! Glad you loved it! I read this when it first came out, and is one that I recommend a lot. It used to be my go to book as a recommendation, but now it has been replaced by a Susanna Kearsley book! I must revisit it myself soon.